When it comes to mirrorless cameras, especially pro-grade ones, Sony’s full-frame Alphas are king. Panasonic’s Lumix GH5 and Olympus’ OM-D E-M1 Mark II come close, but both of those have Micro Four Thirds sensors, which for a lot of picky people puts them out of the running. And when Sony released the A9 earlier this spring, we said said shooting with Sony’s $4,500 flagship felt like cheating. But the new A7R Mark III might be even better, because despite costing more than a thousand dollars less, it’s arguably a much more versatile camera overall. 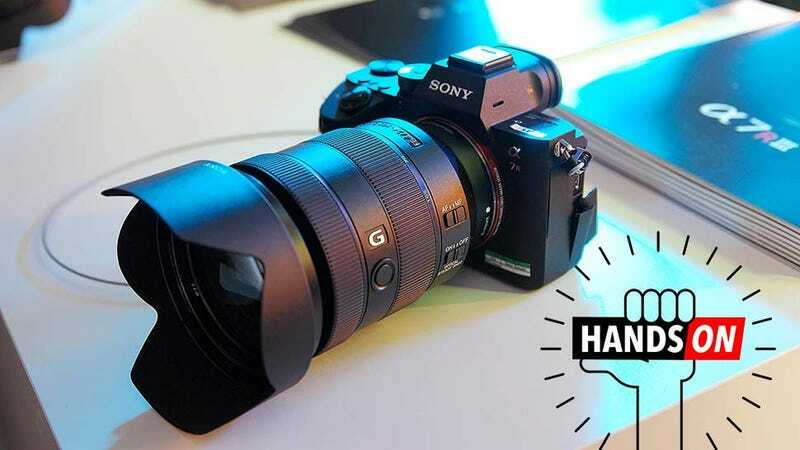 To start, the $3,200 A7R III features a 42.4 megapixel sensor, which gets dangerously close to medium format territory and is double the resolution of the 24.2 MP A9. But then Sony takes that one extra step with a new Pixel Shift shooting mode that shots four photos while moving the sensor one pixel each time so that you can combine all the shots using Sony’s new Image Edge software into a single monstrous 170-MP composite shot. Sony has also added a new joystick to the A7R III up and to the left of the traditional d-pad (where your thumb naturally rests) so you can better utilize the camera’s 399 phase-detect AF points and 425 contrast AF points. But the real craziness is that you might not need use the joystick at all, because Sony says its autofocus tracking system is twice as good as before, even when it comes to its unique eye-tracking feature. With eye-tracking, the camera is no longer relegated to just looking for faces, and it should help Sony’s mirrorless fend off tech like Canon’s dual-pixel AF or Nikon’s 3D tracking feature. And when you combine all this with the A7R III’s 10 frames per second continuous shooting and its ability to track and adjust focus and exposure between every shot, that’s when the real fun starts. And after the camera got announced yesterday morning, Sony invited me to a private shooting event to try the A7R III for myself, along with the company’s new $1,300 24-105mm f/4 G OSS zoom lens. Here’s a 3 second 10 fps burst with eye-tracking on shutter priority at 1/200th of a second and ISO 800. Notice how sharp almost every photo is. If you look closely through this series of shots, you can see how the camera is fine tuning focus and exposure between each shot. Note: Our publishing platform does some annoying compression on photos, so if you want some cleaner looking images to pixel peep, click here. Now you’ve got to remember, these demos were set up by Sony precisely to showcase the A7R III’s new features. But still, I couldn’t help being impressed. One of the first things I tried was the A7R III’s eye tracking feature, which works by holding down the center button on the d-pad and then shooting like normal. After automatically locking on, I marveled as it tracked a ballerina as she danced across the stage, even taking care to switch between eyes depending on which one was closest to the camera. Even when things got in the way, more often than not, the camera’s eye tracking would pick right back up when her face came back into view. For portraiture, the A7R III might be even more well suited, as its high megapixel count lets you see every detail while catching every single micro expression. It makes you just want to keep shooting, which is something that often had me running into the camera’s buffer. When shooting in RAW, the camera caps out after 28 continuous shots. That’s only about three seconds, which can make timing things difficult. You can help alleviate that by capturing full-res JPEGs instead, which bumps the buffer up to 76 shots, but that’s not a real solution for people trying to take advantage of the A7R’s 14-bit uncompressed RAW capability. I also noticed that while you can still change settings like modes, aperture, or shutter while the camera is processing buffered photos, you often won’t be able to dive into the full settings menu until it’s done. Shot at f/14 at 1/250th of a second on ISO-800. When I decided to turn away from the hosted demos, I snapped a quick shot of the sun passing behind the Javits Convention Center to test out the A7R III’s dynamic range, which is the difference between the darkest and brightest point the camera can capture. Sony says the A7R III offers 15-stop of dynamic range, and even when viewing the unedited JPEG version, I loved how the camera captured so much detail in the clouds. Although, I was hoping for a little less grain and maybe a little more detail around the sun. Kudos to Sony for including a USB 3.1 Type-C port along with HDMI, micro USB, headphone and audio in, which should make for fast data transfer and speedier tethered shooting. When you want to be a little less obtrusive, you can even switch the A7R III into silent shooting mode while still keeping its 10 fps continuous shooting. And Sony isn’t joking, it is totally silent. The only way I knew the silent electric shutter was still rolling was seeing the tiny blip of black screen between each shot. This mode seems ideal for wedding photogs or others who shoot in environments where even the slightest noise can be a disturbance. The A7R III also made it super easy to track this guy’s dancing. For an album containing full-res images from the slideshow above, click here. Now for sports and action photographers, the A9 and its 20 fps continuous shooting is still the best pick. But for everyone else, this is the expensive Sony you should be looking at. But I got to say, even for me, someone obligated to carry a camera to every meeting or event, this thing is overkill. I’d probably never be able to put everything it has to use, but that’s exactly what makes it so fun. To see full resolutions versions of the photos in both slideshows, you can go here, and here. Pre-orders for the A7R start today, with shipments due sometime in November.